This is another one of those projects that I've been meaning to make for awhile. It's a cute little "trash can" to use while I do my handwork projects. I was using a clear plastic baggie (which felt so incredibly lame) so this fabric version is a major upgrade. I used some treasured Kaffe fabric for the outside and Montecito fabric for the lining. For once I didn't use "junk" fabric for my first try. Maybe there IS hope for me and my fabric hoarding tendencies after all?!?! It's flexible, so it folds up and fits nicely in my little travel box. It was super quick to construct-I think it took me longer to get a half decent photo than it took me to sew it up. Hurray for an instant gratification project! Now for a non-instant gratification project...I have a new pattern up for sale in my shop! 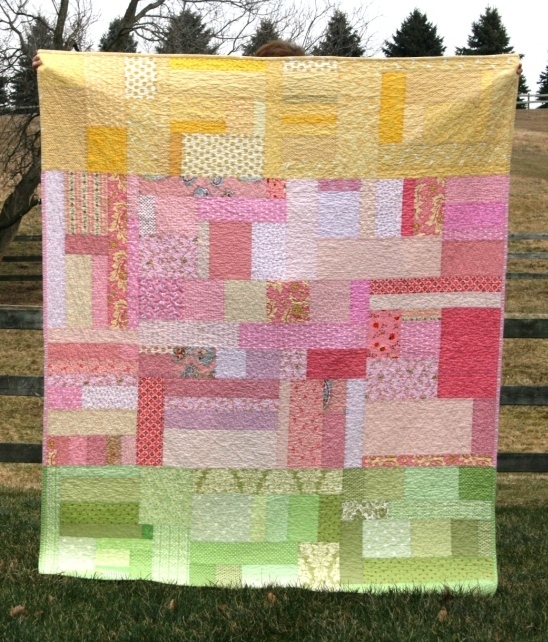 This quilt, Lazy Summer Days, was originally designed for the Sew Hip Magazine as a mystery quilt pattern. I'm happy to announce that it's finally for sale as a stand alone pdf pattern. If you are not a pastel lover it looks great in bolder colors, too. You can read more details about the pattern and purchase it here. Can you believe that I paper pieced this block with less than a fat quarter of background fabric? I did and I can hardly believe it! This block was made for Mary as a part of the Two's Company Bee. Thanks to some tips from the group members (and a phone call with Tara), I was able to make this block with less than a fat quarter of red fabric. As one who hates to waste fabric, this got me pretty excited!! What I did was cut out the templates from paper, then add 3/8" around each piece. I numbered the pattern pieces to correspond to the pattern of the block. I folded my background fabric into 4 layers and fit the pattern pieces on the fabric like a puzzle before cutting anything out. Then I cut very, VERY carefully. I was skeptical as to how it would work to paper piece with pre-cut pieces, but it went so well! I still had to do some trimming after I added each piece, but the wasted fabric was so minimal, I was truly amazed! And it was easier to see where to place your fabric piece, because you didn't have to deal with any extra bulk. I'm excited to try it again sometime! I'm by no means an expert on paper piecing, but I know enough to get by. I'm feeling pretty happy to have a new trick up my sleeve! Speaking of paper piecing, Penny is teaching a paper piecing retreat again this year. I was able to attend last year and it was a blast. You may want to check it out! Welcome to week 12 of finish it up Friday! I started this quilt for a friend shortly before Christmas and finished it on the 31st of December, so it's been done for awhile. Last night I gave it to a sweet friend as a belated birthday gift (she LOVED it! ), so I can finally blog about it! I started with a simple patchwork center, made mainly from 30's prints (Hope Chest fabrics from Connecting Threads and other stash) and then added a wide white border, which I scalloped. It was my first time ever scalloping edges and I love the look! The process wasn't too bad, either. I started by watching this tutorial. I didn't want to order their special gadget for scalloping, so I used a plate and a water soluable marker and pins. A little marking and remarking the curves before cutting, and I was good to go. The results ended up pretty dandy! The edges are bound with bias binding. It's roughly a twin size, but I made it so it could also double as a table topper for her dining room table. Or it can be used as a lap quilt, too. Gotta love having so many options! Now it's your turn! Please link up and share your finishes for the week. Remember to link up to a specific post and comment on other links so we can cheer each other on as we celebrate our finishes. I've had my cool colored solid scraps set aside for quite awhile now and I've been wanting to play with them in the worst way, but it seems like there is always something more pressing that needs to be done. I recently signed up for the Fab Little Quilt Swap and I'm using that as an excuse to finally dive in. Yay!! I'm trying my hand at improv piecing again and I'm feeling very rusty. It's been awhile! Swaps make me a little (ok, a lot) nervous and I feel like the pressure is on. But on the other hand, it will be a good challenge. The biggest challenge will probably be stopping at a mini quilt size. :) I'm not completely sure where this is headed, but it sure is fun to play! I also wanted to say thanks so much for all your sweet comments about Hailey's pillow...I appreciate them very, very much! My daughter and I attended our friend Hailey's 5th birthday party this afternoon. I'm always stumped at what to buy/make/give for birthday presents. Once this idea popped in my head I just ran with it. One scrappy patchwork pillow, complete with personalization! It measures about 18" finished and it has an envelope backing, so it washable. I was so thrilled when Hailey opened it up because she immediately hugged it. I think I have a new go-to gift for the next year of birthdays....hip, hip hurray!!! Now my daughter wants one. Come to think of it, I just might want one, too. edited to add: the squares for the pillow were cut at 3.5" and finish at 3". For the name I first drew guidelines with a water soluable pen and then I free motion quilted it with 50 weight thread on white fabric. I traced over the letters twice to make them a bit more bold. Welcome to finish it up Friday! I hope you had a more productive week than I did! How about you? Do you have a finish from the last week to share? If you do, please link to a specific post and share your finish! Then visit a few other links and help cheer others on in their finishes as well. I came to the decision that I needed to split up these lovelies, even though it just seems so...wrong...you know? Normally, I sort my stash by color, but when I get a FQ bundle, I have a hard time letting them mingle in the stash. It's silly, really, because mixing colors and fabric is one of my very favorite parts of quilting. It's NICE to have the pretty stacks of fabric all color coordinated. But then I have to think of the PERFECT quilt idea that matches that fabric bundle. And then I have to actually find the TIME to sew it up. In the end, the fabric sits for quite awhile. Too long, usually! So, I thought it's best to let them mingle with others. This was a HUGE stretch for me, as I can hardly make myself unbundle them in the first place, (I'll confess, the plastic was still on the bundle on the right) let alone mix them up. But I have a feeling that the this way the fabric will actually get used. What a concept! Next on the list, a few of my (not so favorite) layer cakes divided up into the scrap baskets. After all, it's all just fabric, right? Yesterday I spent all day in bed, as sick as can be. I can't remember the last time that happened. I often say that I want a day off, but I would have much rather have worked! :) I'm so thankful for my husband, who not only worked from home but also kept the kids quiet/calm and fed all day long AND did all the laundry. He's such a great guy! My kids did great, too. I'm so thankful for my wonderful family!!! Today I'm so glad to be back in the land of the living. I'm still recovering, so I'm trying ease into things. (not easy for me!) Thankfully, I have my hand pieced stars to keep me busy. I'm up to 50 stars in the main piece! I have several other stars that are in various states of completion. If I make it a lap size I'm almost half done with the top! I am loving the process AND the results. edited to add: the specifics of this quilt (including a link to the tutorial) can be found here. About the last finish it up Friday post...sorry about the links getting cut off. I'm not sure what's up with that...I was able to access the last row of links (just barely) on my ipod, but not on my computer. Anyone know how to fix it? I'm afraid if I mess with the format, I'll loose all the links. I'll be sure to try to fix it on next week's post! edited to add: if you place your cursor right after any of the numbers in the last column, then hit the TAB key, the links will show. thanks so much, Elaine! Welcome to week 10 of finish it up Friday! Today I only have 2 little things to share....I made myself a GIANT pin cushion yesterday. I put the rotary cutter in the photo for scale. It's 7" square! It's made from scraps I had laying around and it's simply filled with stuffing. Adding the buttons (top and bottom) was the trickiest part. I just LOVE it! Here's a detail shot of the back....isn't it darling?? It's constructed very similar to a coffee cozy. It turned out so SO MUCH cuter than I had imagined it would be. I absolutely LOVE it! Getting this project off my mental list feels soooooooooooo good!!! Now it's your turn! Please link up your Friday finish here and so we can cheer each other on in our finishes! Thanks so much for those of you who link up and join in. And to those of you who don't, hey, thanks for reading! :) Happy Friday! ﻿I've been thinking about prioritizing a lot lately. It goes hand in hand with my resolution of being intentional this year. 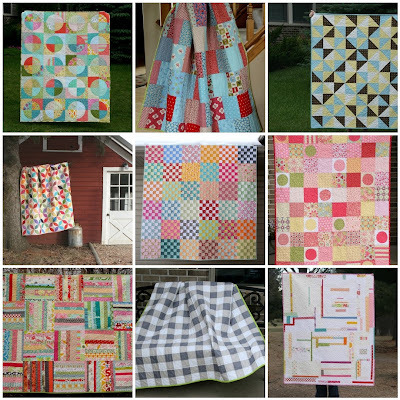 I have more quilt ideas and plans than I can shake a stick at. (And more fabric, too!) Too much inspiration is not necessarily a bad problem to have, but it can be painful at times. It's been feeling painful lately. I'm trying to figure out how to prioritize and to be honest with you, I'm not having much luck. I jot my ideas/sketches down on a scrap piece of paper as I think of them on whatever scrap of paper I can get my hands on. (I've tried to have just ONE notebook and for some reason that doesn't work for me...) The ideas continue to rattle around in this crazy head of mine. Eventually one idea screams louder and longer than the rest...and then eventually I jump in. That's how I prioritize. I think I may need a new method. (Or, I hate to say it, fewer ideas!) So, my question to you is how do YOU prioritize? So, I started a new project on Saturday. I was trying really hard to get down to 9 WIPs before embarking on something new, but I broke down and gave in. I'm very excited to be using fabric that is NEW while it is still new. What a concept! (I still have a FQ set of Sherbet Pips that I haven't touched yet. And Ruby, too. I just can't keep up!) This fabric line is A Walk in the Woods by the charming Aneela Hoey. The fabric is so sweet and soft. I just love it. For the pattern I started with my whirlygiggle block tutorial that I tweaked just a bit, so no trimming this time around. Bonus! I'm forcing myself to not rely on white as a background (as much as possible) so I made the blocks interlock instead. I like the results very, very much! It's gonna be one sweet little baby quilt. Welcome to week 9 of finish it up Friday! Today I'm happy to show you a very funky finish. this was my very old (12+ years) entryway rug that we've had since our very first house. It's done it's job, but the backing is disintegrating, the edges are raveling...it was past time for something else. Isn't it fabulously funky? I made it from old knit shirts and upholstery squares. You can read about how I made the squares here. It wasn't exactly easy zig zagging the squares together, but it came together after a bit of wrestling. I'm so happy be done and finally using the new rug! I just love it!!! It came together better than I could have hoped. The frugal girl in me is DELIGHTED to have made something so useful out of repurposed materials. When I started out, I thought "at least it will make a good conversation starter". :) In the end, I'm so glad it worked out...and so well! How about you? Do you have a finish to share? If so, please link up to a specific post from the past week. Then go ahead and visit a few other links and leave a comment when you visit so we cheer each other on in our finishing! I wore out my first walking foot. The first walking foot lasted me over 5 years...so I guess I can't complain. Boy, is it nice to be using a working one again! I hope you all had a marvelous new year celebration! We spent some time with my husband's family and it was quite pleasant. Today was the first day of everyone back to their normal schedules. I am happy to be getting back to my regular routine...I think I spent most of the day trying to catch my breath! Meanwhile, I've been doing my usual new years reflecting over the past several days and here's what I came up with. My one goal for 2011 was to "make the quilts that I wanted to make and make them the way I wanted to make them". There really isn't a way of measuring that. I think I could have done better, but I certainly could have done much worse! I ended the year with about 12 quilt WIP's...down from 25. Some of the remaining WIP's are long term projects, so I'm pretty happy with that number! This is going to sound completely crazy, but I hope to quilt a little bit less this year. Maybe I should say, I would like to be more intentional about how I quilt. I think I need to quilt the right things (more for others, to start with) and less "just because" quilting. I'm not sure I can actually DO this, but it's a nice thought. Also, I would LOVE to try to make a dent in my stash. I realize this is in direct opposition of the first goal of quilting less. (ha! Such is my life!) So maybe I should say I hope to buy very little fabric this year. I told my husband that the only things I should have to purchase this year are thread, batting and maybe some white fabric. He kind of laughed at me...probably because he knows the chances of that happening are very slim. Or maybe he laughed because he thought I shouldn't even need to buy that much! This isn't quilt related, but I want to decorate my house and make it "ours". We've lived here for over 4 years and we still haven't done much to it. I would like to start focusing on house stuff a bit more. It will be fun to see things take shape and improve. It'll also likely involve covering most of my world in patchwork, so bring it on, I say! Beyond that, I want to be more intentional about how I live my life in pretty much every area. It won't be easy, but it will be a very good thing! Here's to a wonderful new year! The winners of the Pat Bravo fabric giveaway are MG and Lee from Arizona (comment #48). Please send me your addresses so I can hook you up with your fabric. Thanks to everyone who played along!